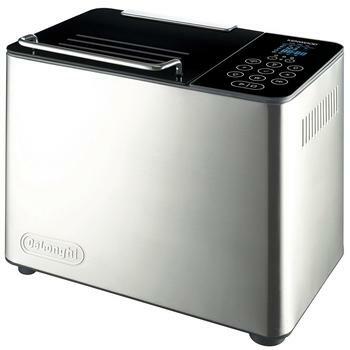 What Makes DeLonghi DBM450 a Popular Bread Maker? It’s getting harder and harder to pick out the best bread maker from the crowd. New bread machines and accompanying bread machine reviews pop up every year. Ever since the first home breed of bread maker was introduced, almost every appliance manufacturers have joined in the fray. Almost every brand now has their bread machine offering in the market. That’s when bread maker reviews come in useful. That’s how you find out exactly what to look for in a bread machine. There are some features that have become de-facto standard of even the basic type of bread maker while some are rarities or value-added features. DeLonghi may be better known for its sleek and passionately designed coffee makers. 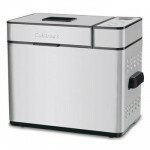 Does it mean DeLonghi DBM450 bread maker can’t be a great option for those looking to bake their own loafs of bread? Read on and find out. Is DeLonghi DBM450 All about Style? Bread machines have developed a common set of features that they all possess. The most important of these is the delay timer, a signature of the bread machine. The delay timer is a tool that allows the bread machine to have bread ready at a certain predetermined time. So far, I have never seen one that permits a delay of longer than 15 hours. This is because the ingredients, like milk and eggs, might spoil if left in the machine for too long. The basic machine now also has a variety of options for different kinds of bread, like French bread, gluten free bread, wheat bread, nut bread, and even jam. For nut and fruit breads, the machine will allow the user to add in the ingredients at the proper time. The machines can also knead and prepare a dough without baking it. 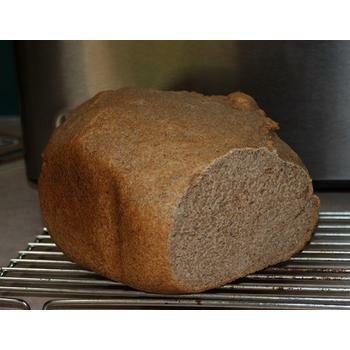 The basic setup of all bread machines is a rectangular pan that holds the ingredients, along with a rotating paddle that acts as a mixer for the ingredients and a kneader for the dough. How Does DeLonghi DBM450 Fare? This bread machine review concerns a single-blade model, the DBM450. It is a 23 pound monster. 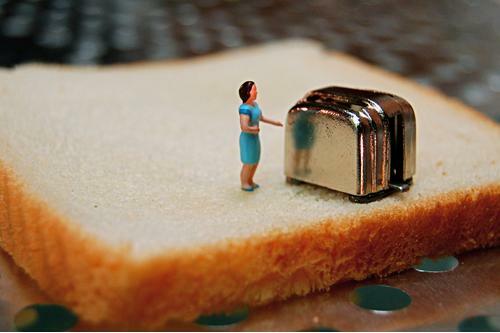 At its weight, it is heavier than most bread machines. Opinions among DeLonghi DBM450 owners have been mixed. Some users like it because the weight makes it sturdy and about right to give it a reasonably ‘expensive’ feel. Of course others are not quite positive and some find the weight to be overkilling, considering it is to be place on a countertop. It does have a slick chrome appearance, with a modern black touchpad. 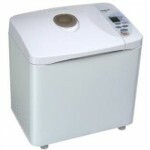 Now usually, bread machines can make a loaf of 1 pound, 1.5 pounds, or 2 pounds in weight. 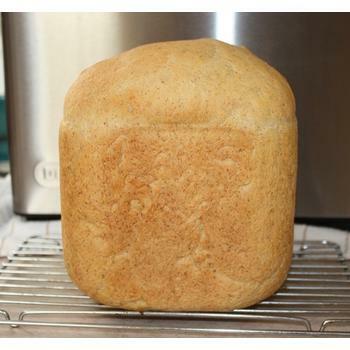 However, the DBM450 only makes 2 pound loafs, which is an unusual downside. The key innovation of this model is the special kneading device. The kneading paddle has been designed to avoid the traditional bread machine problem of tearing holes in the loaf and getting stuck. Any contender for best bread machine needs to address this problem. This is usually a feature that’s absent in entry-level models like Breadman TR520 but present in higher end models like Breville BBM800XL and Zojirushi Virtuoso. It has a few other high-end, but not necessarily unique features. The first is an ingredient loader. This allows the user to put in fruit, nuts, or other supplemental ingredients at the start of the process, and then the machine will add them at the right time automatically. This eliminates the usual step of having to come back partway through the cycle to add these ingredients. The last special feature is a fan assisted baking process that is meant to distribute the heat and moisture in the machine evenly during the bake cycle. User feedback is generally positive for these features, which is good, because otherwise this machine would not have much unique to offer. The ingredient loader in particular is a useful addition, because several other notable models lack one. This ‘smart’ feature makes the use of the delay timer with advanced fruit and nut breads possible. As others have shared in their reviews of DeLonghi DBM450, the bread coming out of the machine is of good quality, and looks especially good. The lack of versatility means it can’t be the best bread maker for everyone. But for a person who likes large loafs and can use the advanced features, the DBM450 is a great pick. So what do you think? Do you think DeLonghi DBM450 makes the right candidate to get you started practising your baking skills? 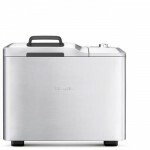 Emeril’s T-fal OW5005001: Probably the Most Popular Bread Maker?